We are thrilled to present a double whammy author event for March, a real treat for thriller and crime fans! 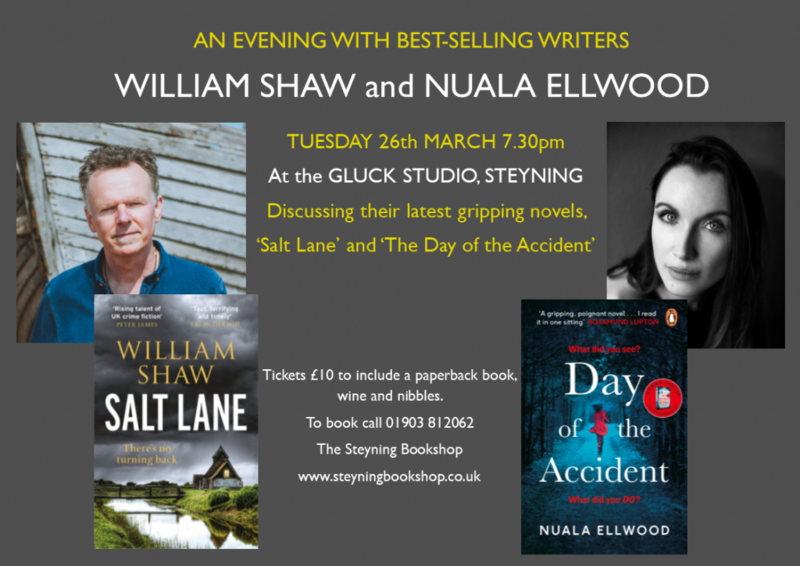 On Tuesday March 26th, 7.30pm at the lovely Gluck Studio, best-selling writers William Shaw and Nuala Ellwood will discuss their latest novels. William Shaw is a firm favourite with local readers now, having interviewed Peter May at our author supper last year, and appeared at our crime-writers night during the Steyning Festival. William Shaw will be in conversation with up-and-coming thriller writer Nuala Ellwood about her second novel, Day of the Accident , a dark, twisty and multi-layered psychological thriller which is already gathering ecstatic reviews. Nuala’s first novel My Sister’s Bones, also published by Penguin, saw her being featured as one of The Observer’s ‘New Faces of Fiction 2017’. Day of the Accident follows wife and mother Maggie, who awakes from a coma after her car plunges into a river to be informed that her daughter is dead, drowned during the accident, and her husband, Sean, has disappeared. But she can’t shake the feeling that somewhere, somehow, her daughter is alive and that there is more to the accident than meets the eye. We can’t wait to hear more! The event price of £10 includes a paperback book by one of the writers – how will you choose? Plus wine and nibbles.